Now: a mysterious, goateed man believing himself to be playing the part of God, is controlling the minds of the masses through electromagnetism and sound waves. Cal — a confident Sherlock Holmes look-alike — and Lex — a skeptical bald-headed man in 80s clothing — are tasked with inspecting the case by learning more about the topic from Alexander Graham Bell. Using the W.I.L.D. (Wake Initiated Lucid Dream) Machine created by their scientist leader, the two men essentially make a copy of a past event involving Bell, ensuring that the original happening will not be tampered with. Then: It is 1913 and Alexander Graham Bell has created a hybrid creature called a Sheeple — a cross between a person and a sheep — in order to experiment with sound manipulation and mind control. His tests are cruel and inhumane and other leading members of society — The Rockefellers and the Morgans among others — are privy to his doings; but when Cal and Lex are transported to 1913 and encounter Bell and a group of Sheeple, the W.I.L.D. Machine goes haywire and the two heroes minds are at stake. 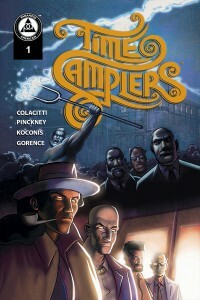 There are certain aspects of Time Samplers #1 that I enjoyed. Instead of having a time machine, Gorence, Koconis, and Pinckney deliver a new twist to “time travel”: in order to make a copy of a specific event using the W.I.L.D. Machine, one must have an object directly related to the said event. It’s a cool idea, but hard to explain. I also think that Hanchey’s art is spectacular. The characters are rich with very strong features. His color scheme presents a wide variety of darks and lights, offering an interesting mix of realism with a cartoon look. When Cal’s and Lex’s minds are traveling through time, Hanchey uses a very lively, psychedelic color pallet that totally works. Here is the problem with Time Samplers #1: there is way too much going on in only 23 pages, presented in highly technical terms, making the comic extremely difficult to follow. A whole lot of telling is occurring and not nearly enough showing. I found myself having to read pages over multiple times and was still unable to fully grasp the ideas set forth. There’s a character in the issue, a pawn shop owner, who helps the men out by giving them a tuning fork created by Bell. The man constantly has to ask Cal, Lex and the scientist to repeat themselves using vocabulary that he might understand. If I were a part of this world, I would be that character. I cannot recommend Time Samplers. While it does have a few nice aspects, overall it falls short of its grandiose ideas. Like Cal and Lex, I was left feeling lost in time.